HotCity Theatre thrives on the unusual and now they step back in time and take Joe Orton’s 1964 ribald black comedy, “Entertaining Mr. Sloane” and make it relevant for today’s audience. Presented as a period piece, the wonderful C. Otis Sweezey set design creates the atmosphere and this brilliant cast does the rest in their “matter of fact” presentation of this outlandish material. Fasten your seat belts, this is a bumpy and unexpected ride. Kath, the wonderful Lavonne Byers, opens the play with her provocative “interview” of young Mr. Sloane, played with a sleazy, gratuitous manner by Paul Cereghino. The chemistry of their characters is transformed into these two actors so you get every creepy innuendo and, eventually, outright physicality. The interview is for a room to rent and Kath already has her sights set on the younger man with a mixture of motherly instinct and pure animal lust. Their cat and mouse game continues through his initial need to dispose of his trousers while she “soothes” his injury that just happens to be on his inner thigh near his crotch and finally into an all out free for all on the sofa. The injury is a result of a stabbing by Kath’s father, played with delightful befuddlement by Bill Grivna. He’s suspicious of the new young man and thinks he recognizes him as a murderer. He may not be far from the truth as the ensuing encounters show us that Mr. Sloane is not necessarily the pleasant young man he portrays in polite company. Rounding out this quartet of players is Michael James Reed as Kath’s brother who also takes a liking to Mr. Sloane and takes him on as his chauffeur. Though boisterous and seemingly in control of his reason except where this blind spot with Mr. Sloane comes in, he proves to be as bizarre and off-center as the rest of the family. Playwright Orton has created the dysfunctional family before that phrase came into common practice. Add the homicidal- or at least mean-spirited- temperament of Mr. Sloane and you’ve got the makings of one of the best black comedies to come out of any era. Appropriately, the whole play takes place in the salon (or living room) of a nice house built on the edge of a garbage dump. Pretty apropos of the goings on inside the household. Director Bill Whitaker has taken this script and let it play out in all it’s glory. Every nuance in both word and movement becomes heightened as the evening goes on and you realize you’ve stepped into the middle of crazy incorporated. Add that brilliant set design of Mr. Sweezey that spreads across the Kranzberg stage and a wonderful lighting design from Sean Savoie and you have and “entertaining” evening in the theatre. Becky Fortner’s costumes are right on the money and the wonderful period jazz underscore by Zoe C. Sullivan caps off the production. “Entertaining Mr. Sloane” is a great history lesson in this playwright’s career that was cut short by his murder (at the hands of his lover) very early before his voice was even established. But Joe Orton left us quite a nice little portfolio of work including this as one of his best. 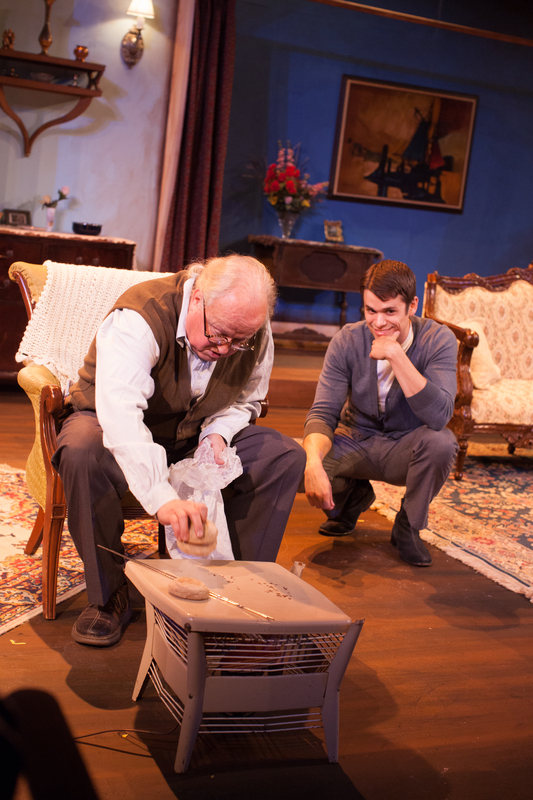 See “Entertaining Mr. Sloane” at HotCity Theatre through September 21st. Call them at 314-289-4063 or contact them at hotcitytheatre.org for tickets or more information. This entry was posted on September 10, 2013 at 9:43 pm09 and is filed under Uncategorized. You can follow any responses to this entry through the RSS 2.0 feed. You can leave a response, or trackback from your own site.